David Wilkerson rightly pointed out that submitting to and embracing God’s will are not one and the same. Submission refers to imposed conditions like “subjecting ” oneself to something or to yield to a superior force. Embrace means to hold closely in one’s arms as a sign of affection. It also means to accept willingly and enthusiastically. When most people think of submission, what immediately comes to mind is “force” and “discipline”. Sadly, we often view God this way. We see him as an imposer who has handed down a set of rules and commands which we have to obey. True salvation comes with understanding the benefits of God’s will. Once we have this understanding, we begin to embrace God’s will. When we embrace, we do not obey God just because we have to. Rather, the love we have for God will manifest in our actions (without force) and ultimately our actions will reflect God’s perfect will. While on earth, Jesus acknowledged that he was on earth to do the will of his father (John 5:30, 4:34, 6:38). Recognising that God’s will and our will may not necessarily be the same. Jesus knew at all times that doing the Father’s will trumped everything else and this is my confession for today. I pray for the grace to die to self will in order to fully embrace your will for my life. 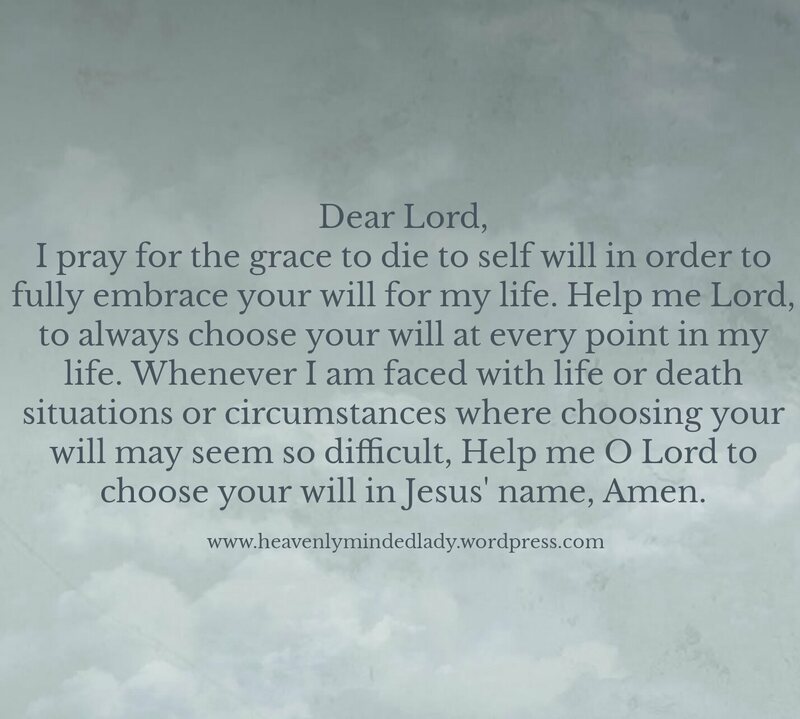 Help me Lord, to always choose your will at every point in my life. Whenever I am faced with life or death situations or in circumstances where choosing your will may seem so difficult, Help me O Lord to choose your will in Jesus’ name. Amen!